Home » Posts Tagged "enclosure"
Italiaâ€™s ethos of minimalist engineering produces enclosures of timeless elegance that create the effects of increased space and freedom. The Celino Walk in shower enclosure presented by Lakes Bathrooms is a great choice for both shower tray fitting as well as wet room designs, A carefully considered range of frameless and semi-frameless shower enclosures designed in Rome by Italian design house Talocci and manufactured in Italy by Provex. 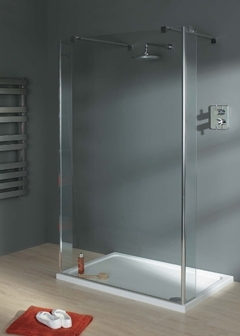 Provex is internationally renowned for the high quality of its shower enclosures. All Italia shower enclosures are manufactured to European standard EN14428 and come with a no quibble 10 year guarantee.